Spina bifida is a condition that affects the spine and usually occurs in the early stages of fetal development. When the neural tube doesn’t close all the way, the backbone that protects the spinal cord of the fetus doesn’t form and close as it should, resulting in damage to the spine and nerves. There are three different spina bifida types, including myelomeningocele, meningocele and spina bifida occulta. 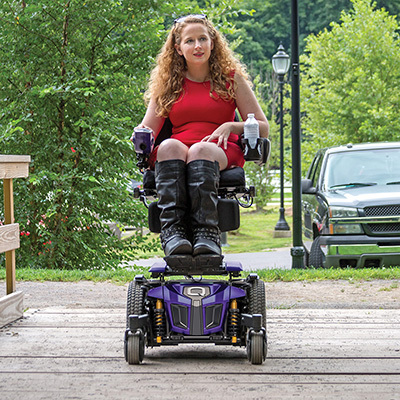 If you or a loved one have spina bifida, Quantum® power wheelchairs can help enhance independence and mobility. Depending on the severity of their condition, some living with spina bifida symptoms can be fitted for a complex rehab electric wheelchair that is programmed to meet their needs. The Edge 3 motorized wheelchair is compatible with an array of power seating, positioning and drive controls. 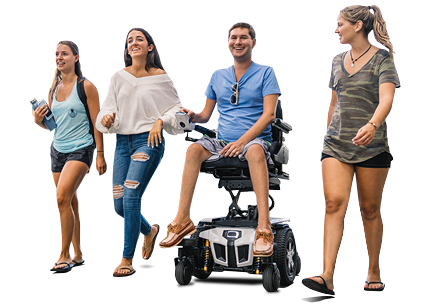 The Edge 3 electric wheelchair is available with optional 4.5 mph iLevel® power adjustable seat height, allowing the user to drive at 4.5 mph while at 12 inches so they can safely cross streets and parking lots. iLevel technology greatly improves daily functionality and quality of life. iLevel’s patented Extra Stability Technology® enhances safety for transfers, reach, cooking and many other activities of daily living. Depending on the spina bifida type and severity, individuals may use Q-Logic 3 Advanced Drive Controls to drive their motorized wheelchair. The controller system is highly customizable and expandable, maximizing user independence. Standard with Bluetooth®, an individual with spina bifida can operate his or her smart phone or tablet using their Q-Logic 3 screen. With the Q-Logic 3 EX Enhanced Display, spina bifida patients can also operate a wide range of appliances that use infrared (IR) remote controls using their power wheelchair controller. Individuals living with spina bifida symptoms may also benefit from Stealth Products® wheelchair cushions. These wheelchair cushions provide various functions respective to each cushion including general use and skin protection and positioning. The TRU-Comfort 2 wheelchair cushion features a CoolCore® technology cover that is breathable and moisture wicking, keeping spina bifida patients cooler in warm weather and warmer in cooler weather. In addition to CoolCore technology, the Spectrum® Foam and Spectrum® Gel cushions feature a urethane liner for incontinence and a contoured, high-density molded foam base.